Earls is actually a Canadian chain, based out of Edmonton, Alberta, and the chain now has close to 70 locations, but only a handful of those have arrived in US locations. The menu is based upon sustainably raised meat and seafood in a menu that I’d call a mix of “North American Fare” (well, I’d call it “American” aside from the Canadian ownership) and “Asian Fusion Cuisine”. It’s rather an eclectic mix, but I’ll have to say, I’ll actually enjoy a place where I can get, say, a Moscow Mule, a good American craft beer, a Caesar salad, and a good Kung Pao chicken. Which, as chance happens, was actually my order. 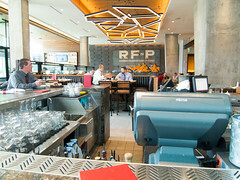 And I’ll have to say, they do a rather pleasant job with their food. My Moscow Mule was a nice copper mug served up with a pleasantly gingery ginger beer and fresh lime. The beer selection was a rather nice cross-section of mid-Atlantic breweries. And my food? The Caesar salad was a nicely assembled, not-overdressed, and very crunchy version of a classic. And my “Hunan Kung Pao”? 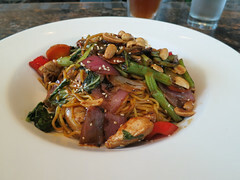 While a distinctly Westernized version of what’s actually generally a Sichuan dish, this was actually a really flavorful dish: a rich mixture of chicken, peppers, and vegetables served over a nice bed of noodles with fresh roasted peanuts and a really pungent pepper sauce. Authentic? No. But delicious? Indeed. So yeah, it’s not always bad when life takes me to a mall. 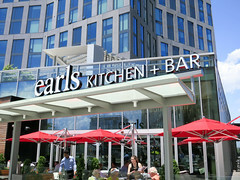 Earls was a pleasant and friendly break from my business travels.